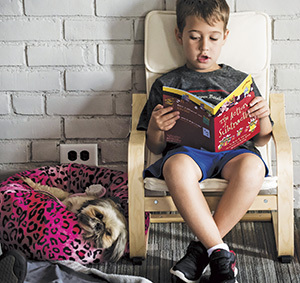 If you see a dog in the children’s room of your public library, chances are it’s not someone’s pet—it might well be a therapy dog, and a child might be there reading out loud to it. And with good reason: Dogs, relaxed and nonjudgmental, seem to help even struggling readers find delight in a good book. 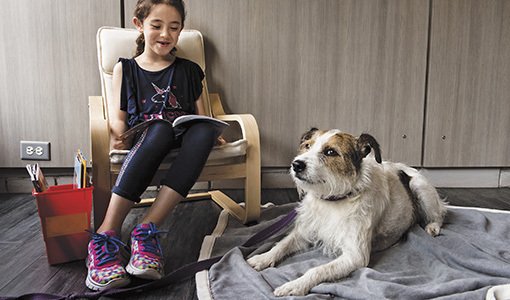 For Deborah Linder, V09, SK16, co-director of the Tufts Institute for Human-Animal Interaction, the trend toward “canine-assisted reading” is more than a feel-good idea—it’s a rich field for future research. Studies have been done in the area, “but we need much more rigorous inquiry,” particularly in educational settings, she said. “If schools want to really tap the potential of partnering with dogs as reading aids, then we need scientific evidence about what works.” That would involve research “to be able to optimize programs that help children read.” What’s also important to the success of these programs is ensuring safety for the animals and the people involved by having proper training and health requirements, she added. Linder is already making headway in that direction with a recently published study about a dog-assisted reading project in a Grafton, Massachusetts, public school. It found that when dogs were brought into an after-school program for second graders, the children reported improved attitudes about reading. The research, built on a similar 2010 pilot study in the Grafton public library, aimed to clarify what components of the canine-assisted reading program affected reading skills and attitudes. The study was published in the Early Childhood Education Journal. “We hope to build on this exploratory model to determine the ideal frequency, duration of reading, mechanisms behind any improvement, and how to optimize benefits,” Linder said. In the six-week pilot study, students were divided into two groups. Members of one group read to a therapy dog for 30 minutes once weekly; a control group followed a standard classroom curriculum. Children’s reading skills were assessed biweekly, and attitudes about reading were assessed pre- and postintervention. In terms of results, reading-skill scores did not change significantly in either group, nor did attitudes about recreational reading. But when it came to attitudes toward academic reading, scores increased significantly among the children who read aloud to dogs. Because the study showed an improvement in attitude but not in skills, “we could envision this kind of program as an adjunct to other programs that do improve skills; they could be used symbiotically,” said Linder, a research assistant professor at Cummings School of Veterinary Medicine. She grants that it was “unexpected” that reading skills did not improve for either group. One possible explanation is that study participants included children who were already good readers. Other influencing factors could be the frequency of the read-aloud sessions and the relatively short duration of the project. Linder hopes the results will inform future efforts to evaluate reading programs that include dogs: Her vision is to enhance the lives of humans and animals through mutually beneficial interactions. There is still much to learn, she said. “Would longer programs with more frequent visits have different results?” she said. Linder had that opportunity this summer. She and Melissa Orkin, AG08, AG13, program director of the Center for Reading and Language Research, were awarded a Tufts Collaborates grant to examine whether reading aloud to dogs could lower anxiety and improve skills in a summer program for remedial readers aged 7 to 11. They’re currently analyzing the results of the study, which sought to measure pre- and postprogram anxiety, engagement, and reading skills of struggling readers randomly assigned to read aloud either to a therapy animal or to peers.